Why You Should Choose This UK Brookwood Wood Cabin for Your Family. Nowadays there are garden log cabin available which tick all sort of boxes and are normally designed to meet our requirements in this modern age. The Trentan ‘Brookwood’ is a very special log cabin particularly. The modern stylish look will stand proudly in your garden and the recessed veranda is really attractive besides being very useful. Add coloured lights or a light in there and it will take on a new look at night. Then give some thought as to the many uses this log cabin can be used by you. But beware you may find a conflict between your ‘other half’ and the rest of your family who will all be wanting to make this special log cabin their ‘one and only’ building. This is what makes it a very special building for your family and your home. Using slow growing Nordic timber this ‘Brookwood’ log cabin is soundly designed for long life. The Swedes know this as this timber is used throughout their beautiful country, which becomes very cold in the winter. The design of the log cabin adds to the sturdiness and the internal metal braces within the internal logs is an extra unique feature which enables these log cabin to stand strong in all types of weather. The very special, modern design is enhanced with Georgian window bars to give a Georgian effect if that suits you or your family. Or as standard, the log cabin has a contemporary look. This small feature reinforces the thought which has gone into the design and backs up the fact that it’s your choice and so should suit you. NO Cheap Materials Used as Care & Attention to Log Cabins is Crucial. You won’t find any cheap or nasty materials in these cabins as the quality of timber used is top notch. Some log cabin firms even use chipboard or OSB boards in them which is totally unsuitable. Also, cheap Chinese furniture is used rather than the rather more robust DGP+ European fittings. The doors and windows on these ‘Brookwood’ cabins have features not available anywhere else. The part laminated materials add extra strength and this reinforces and stops any potential twisting or warping effect. The new DGP+ quality doors and windows with their adjustable hinges make them a joy to hang and to live with. Everything is designed for our great British weather. With the double glazed windows as standard, they will make it a joy to be in. All timber is kiln dried and comes naturally from renewable sources. These log buildings are designed to be easy to erect so can be assembled by any average DIYer. 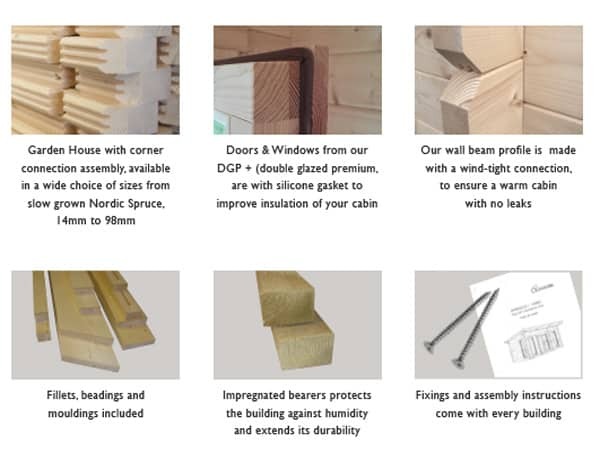 The fact that these log cabins have been designed and tested at the factory to ensure everything works and fits together makes it a doddle for assembly. To make it even easier all parts are bar coded for ease of identification. However, if you would like your new log cabin assembled for you then we can provide details of third parties who can do this for you. Erected quickly and efficiently your new log cabin with its delightful veranda can be in use for your family before you realise it. Well worth considering? The internet, whilst is great for finding garden cabins it, can never show you the quality of the product being displayed. This is why you should make it a prime consideration before buying or viewing examples beforehand, if possible. Even if you don’t view it’s worth dealing with a company which has a log cabins UK display site. This alone proves they are happy for their products to be inspected at close quarter – unlike many firms selling on the internet. If you can visit a display site you can make your own judgment on the quality of the building so that you know when it arrives you won’t feel disappointed or feel misled. 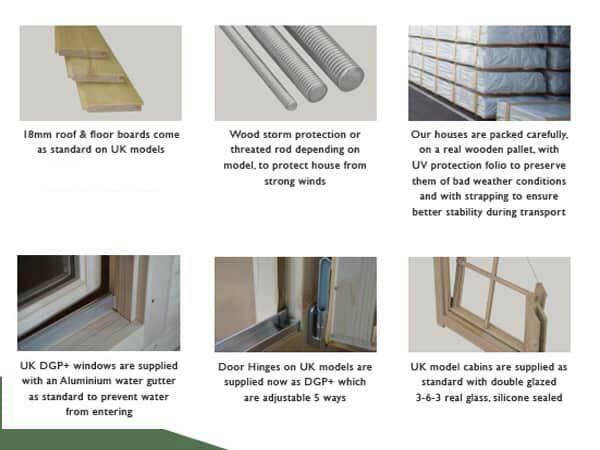 1st Choice’s background in manufacturing garden buildings, which started in 1979, gives us the know-how about the quality of materials which should be used. We are a family based business and our Ethos is ‘Make to a Standard – NOT down to a price’. Size: Size of this Brookwood log cabin is 5.2m x 3.7m (17¼ft x 12ft). All sizes nominal. Apex or gable style. Note this is the external size of the body of the cabin. The lugs extend 100mm on each corner making the overall size (as most other companies quote) 200m larger. We mention this so you know you are comparing ‘eggs with eggs’. Approximate clear internal size will be approx 5.1m x 3.6m. Please check with us if internal size is crucial. Floors: 18mm thick T&G untreated boards used on these log cabin floors. No chipboard, OSB or other cheap sheet materials used on the floor, unlike some other log cabin suppliers. 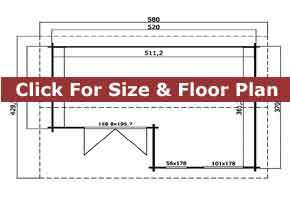 Floor joists are 45x45mm and are normally spaced no more than 650mm apart. All floor joists are pressure treated for long life as standard. Porch : A delightful covered porch area protects over the main double doors providing shade and shelter for the cabin. This log cabin balcony is approx 2.4m wide x 1.2m deep. Doors: Joinery quality double contemporary style double doors 1588mm wide x 1957mm high (62½in x 77in) – approx sizes. Low doors sills giving you easier access into your log cabin. Easy adjust hinges complete with gasket seals, fitted silver finish door handles, cylinder lock and two unique keys. Supplied untreated. Beware of doors with single glazing or excessively high door sills. Windows: One (1) Joinery quality inward opening window, size 56 x 179cm (22 x 70½in) and one (1) fixed window, size 101cm x 179cm (39 x 70½in) included as standard. Complete with easy adjust hinges, silicon gasket seals and delightful silver finish window handles. Supplied untreated as standard. Double glazed as standard NOT single glazed. 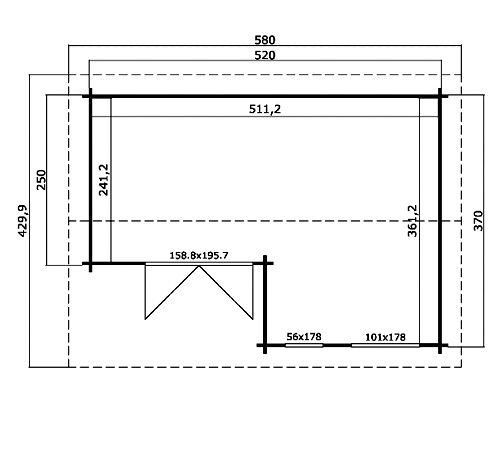 Lower Walls: Height: 210cm (83in) – all Brookwood cabins. Ridge Height: 258cm – on all Brookwood cabins. Fitting: This log cabin with porch is supplied in kit form for self assembly. Option for erection through a third party if required. If being built you would require a concrete base or solid and level paving slab base. Optionally, we have an option for building a base for you. These log cabins are assembled by interlocking the panels for ease of taking it down again if you decide to move. Nowadays there are many garden cabins available which can tick all sort of boxes and are normally designed to meet our needs in this modern age. These Trentan ‘Brookwood’ wooden cabins for sale with their recessed veranda are very special log cabins particularly. The modern, stylish look will stand proud in your garden and is very attractive. When buying a log cabin the best advice is to always see one ‘in the flesh’ to ensure that you are buying what you think you are buying. We have garden cabin display sites where you can see examples of the Trentan buildings so you can see for your self how good they are. Besides that are less than 2.5m high so are planning friendly.